Dominoes is an exciting game for people of all ages and intellectual preferences. 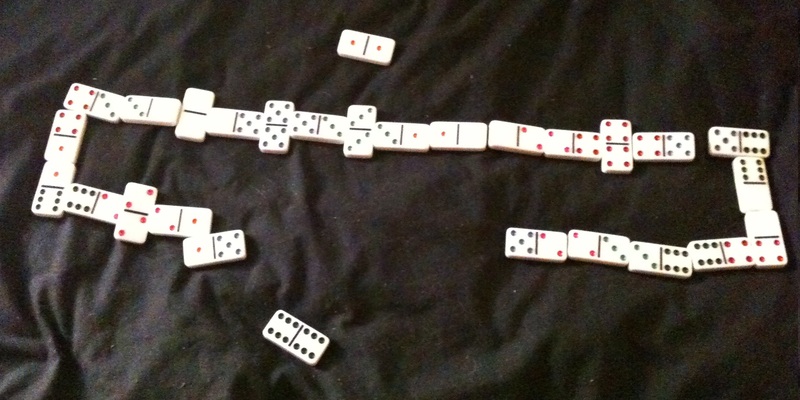 There are many ideas about how to play dominoes, though most of them are similar. This article describes the rules of domino tennis. Can there be a connection between such dissimilar games? Yes! Domino tennis is based upon grouping points by games and sets. Domino tennis stems from Kozel, a popular Russian domino game. Its rules are simple: players (2-4 people) randomly draw 7 tiles each. The lowest double starts the play. Going clockwise, the other players put their tiles to the chain from either end, one at a time. If a player cannot play, they draw dominoes from the unused tiles (“the marketplace”) until they find a playable one. If no such tiles are found, the turn goes to the next player. All the drawn tiles remain with the player who drew them. In order to win, a player must get rid of all tiles. The player or players who lost calculate the number of points on the tiles they were left with. The figure is added to the sums of the previous rounds. A player whose sum reaches or exceeds 125 loses the entire game. The rule of Fish. Fish in dominoes defines a tie when no player can add a tile to the chain. Under Fish in Kozel, every player sums up their points and adds them to the game score. If at the time of his turn a player has two doubles that pass to both end of the chain, he can play both doubles at once (the rule remains in force in domino tennis as well). If at the end of a round (as the result of either Fish or losing) a player is left with only double-zero or double-six, he is penalized by 50 and 75 points respectively. Serving in domino-tennis is the right to play the first tile. Unlike Kozel, a player can begin with any double they have. If the server has no doubles, they must draw tiles from the marketplace until they find one: this is called “a double-fault”. If the opponent cannot play to the first double and is also forced to go to the marketplace, it is called “an ace”. After the game is over, the right to serve goes to the other player regardless of who won the game. HOW MANY POINTS DOES A COMPLETE DOMINO SET HAVE? There are 28 tiles, each with 2 halfs, 56 total. There are 7 categories of numbers (from “zero” to “six”), and each category occurs 56/7=8 times. Therefore, the sum = 0*8+1*8…+6*8 = 21*8 = 168. To win a tennis match, a player must win 2 or 3 sets. To win a set, at least 6 games must be won. To win a game, more than 40 points must be won. Scoring in a game follows as 15-30-40-game. When the score is 40:40, the game continues until the difference reaches two rallies. After winning a rally, a player obtains an “advantage”, but if their opponent prevails in the next rally, the score goes back to 40:40, or deuce. If the game-score in a set is 6:6, a tie-break is played. Each rally is counted as one point. To win, a player must win at least 7 points. If the tie-break score is 6:6, playing continues until the difference reaches two points. WHY IS TENNIS SCORING SO STRANGE? There are multiple versions, here is one. French aristocracy played tennis for money. Each rally cost a 15-denier coin; the winner collected the sum of the game. The switch to 40 instead of 45 is dictated by simplicity: it is faster to say forty (quarante) than forty five (quarante-cinq), especially gasping for air after a brisk rally. By the way, fifteen and thirty in French are just as quick: quinze and trente. So, how to play dominoes by tennis logic? It’s simple. To win a game, a player must make their opponent pick up 50 or more points. If both players have 40 or more points, the game resumes until the difference reaches 10 or more points. In other words, if a game-score is 43:51, the first player must pick up at least 18 points to lose (51–43+10, to 61-51), while the second player needs but two, to 43:53. The set goes to the player who wins 6 games with at least a two-game difference. If the score is 6:5, another game is played. If the score becomes 6:6, a tie-break is played. Each tie-break rally is counted as one point, irrespective of the point sums (with the exception of the rule of penalty). If a rally ends in Fish, the player with the most points loses. If the sums are equal, both players lose a point. To win, a player must win at least 7 rallies; if the score is 6:6, playing continues until the difference reaches 2 points. Depending on the agreement, to win a match a player must win one, two or three sets. While it is not difficult to learn how to play domino tennis, keeping scores can present some initial challenges. Let’s consider the sample score sheet describing a domino battle between Osvaldo and Elizabeth, two imaginary players. The [0:0] in the upper right corner indicates the set score; at the beginning of the match it is obviously at zeros. A dash indicates who serves in the current game. The numbers in the columns stand for the number of penalty points: remember, in domino tennis you try to get rid of points, not accumulate them. A long horizontal lines defines the end of a game. The 0:1 over the right end of the line stand for the game score. Below the lines, another game takes place: note that the serving dash moved to another column. An asterisk indicates that something noteworthy happened; it is explained in the lower right corner of the sheet. If there were several unusual events, the later ones acquire additional asterisks. Most games have rules that complicate them. In soccer and ice-hockey it is offside; in chess it is the prohibition for pawn to go backwards; in checkers it is the obligation to capture no matter what. Domino tennis is no exception. Its bonus and penalty can decide a game in a single rally. To understand their logic, let’s consider the math behind. WHAT’S THE SUM OF POINTS ON THE AVERAGE DOMINO TILE? The minimal possible average for a number of tiles greater than one is 0.5 for two (0-0 and 0-1); 1 for three (0-0, 0-1 and 0-2 or 0-0, 0-1, 1-1); 1.25 for four (0-0, 0-1, 1-1, 0-2); and so on. In domino tennis such combinations are called minimal sequences. A player who collected a minimal sequence divides all the points accumulated in the current game by the number of tiles in the collected sequence. This rule becomes particularly precious in deuce-situations. Let’s say the score is 64-69. A rally is over, and the second player has two tiles left. Their expected sum is 12 (2*6) while she needs only 5 points (to 64-74) to lose the game. However, the tiles are 0-0 and 0-1, and the score becomes 64-34.5. The first players loses the game despite having won the rally. Under Fish, the rule of minimal sequence remains in force. The minimal sequence bonus requires several tiles. If a player has only double-zero at the end of a rally they are penalized by 50 points. Double-six brings 75 penalty points; since it takes only 50 to lose a game, additional 25 penalty points are carried into the next game. However, if a player is left with both double-zero and double-six, only 12 points are lost. A player left with double-zero on a tie-break receives two points instead of one; a player left with double-six automatically loses the tie-break regardless of the current score. We hope this article provided an exhaustive description of how to play dominoes by tennis rules, and you will spend many a pleasant hour enjoying this game. If you have any comments or suggestions, feel free to share with us, we always appreciate constructive creativity. The rule allows using service to the server’s advantage as it allows taking the entire hand into consideration.